Orbenin Ophthalmic Eye Ointment is for the treatment of a range of bacterial infections in the eyes of cattle, sheep, horses, dogs and cats. It is supplied in 3g tubes of ointment. 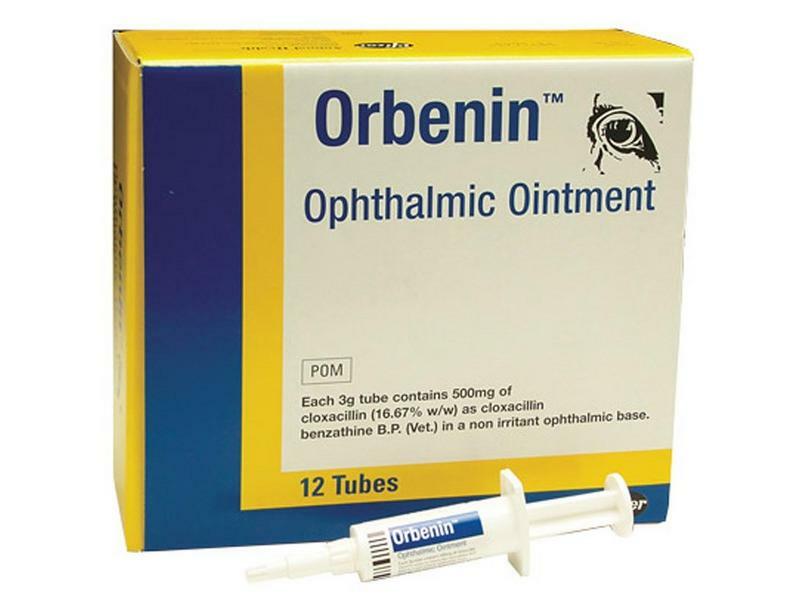 Orbenin Ophthalmic Eye Ointment 16.67% w/w is a sterile off-white, viscous stable suspension of Cloxacillin Benzathine in a non-irritant ophthalmic base with 3% aluminium stearate. It is presented as tubes containing 500 mg cloxacillin (16.67% w/w) as the benzathine salt, in 3 g of suspension. Orbenin Ophthalmic Eye Ointment is effective against a range of bacteria (including Moraxella spp.) commonly isolated from the eyes of cattle, sheep, horses, dogs and cats. It is bactericidal in action and its formulation facilitates persistence of effective cloxacillin levels following a single application. The product is indicated for the treatment of ocular infections in cattle, sheep, horses, dogs and cats where susceptible organisms (including Moraxella spp.) are suspected or anticipated as pathogens. A particular indication, therefore, is treatment of New Forest Disease in cattle. For external use only. Evert the lower eyelid and instil the ointment liberally into the lower conjunctival sac (e.g., approximately ¼ to ½ tube per eye in cattle and horses, ¼ tube per eye in sheep and 1/10 of a tube per eye in dogs and cats). For the treatment of New Forest Disease in cattle and Contagious Ophthalmia (`Pink Eye') in sheep, one application only is normally required; but treatment may be repeated at intervals of 48 hours in cattle and 72 hours in sheep if necessary. Treatment should be repeated at 24 hourly intervals in dogs, cats and horses. If the animal only has one infected eye, it may be advisable to treat both eyes to prevent cross infection. In such cases, it is better to treat the uninfected eye first to avoid transferring infection via the tube nozzle. Animals must not be slaughtered for human consumption during treatment. Cattle, sheep and horses may only be slaughtered for human consumption after last treatment. Milk: cattle and sheep: zero hours. Meat: cattle, sheep & horses: zero days. Penicillins and cephalosporins may cause hypersensitivity (allergy) following injection, inhalation, ingestion or skin contact. Hypersensitivity to penicillins may lead to cross-reactions to cephalosporins and vice versa. Allergic reactions to these substances may occasionally be serious. Do not handle this product if you know you are sensitised, or if you have been advised not to work with such preparations. Handle this product with great care to avoid exposure, taking all recommended precautions. If you develop symptoms following exposure such as a skin rash, you should seek medical advice and show the doctor this warning. Swelling of the face, lips or eyes or difficulty with breathing, are more serious symptoms and require urgent medical attention. Wash hands after use. Do not store above 25°C. Dispose of any unused product and empty containers in accordance with guidance from your local waste regulatory authority. Any contents remaining 28 days after first opening should be discarded. Care should be taken to avoid contamination of the contents during use. Keep out of the sight and reach of children. For animal treatment only. The consistency of Orbenin Ophthalmic Eye Ointment ensures even distribution of ointment across the cornea and the conjunctival mucosae. Effective cloxacillin levels are maintained for sufficient time, after only one application, to effect a cure in the majority of cases of New Forest Disease and Contagious Ophthalmia. Treatment of a batch of 'in-contact' cattle or sheep, at the time clinical signs first appear in some individuals, may reduce the overall severity of outbreaks of ocular disease on a herd/flock basis. Orbenin Ophthalmic Eye Ointment is effective against a range of bacteria (including Moraxella spp.) commonly isolated from the eyes of cattle, sheep, horses, dogs and cats. It is bactericidal in action and its formulation facilitates persistence of effective cloxacillin levels following a single application. The product is indicated for the treatment of ocular infections in cattle, sheep, horses, dogs and cats where susceptible organisms (including Moraxella spp.) are suspected or anticipated as pathogens. A particular indication, therefore, is treatment of New Forest Disease in cattle. Evert the lower eyelid and instil the ointment liberally into the lower conjunctival sac (e.g., approximately ¼ to ½ tube per eye in cattle and horses, ¼ tube per eye in sheep and 1/10 of a tube per eye in dogs and cats). For the treatment of New Forest Disease in cattle and Contagious Ophthalmia (`Pink Eye') in sheep, one application only is normally required; but treatment may be repeated at intervals of 48 hours in cattle and 72 hours in sheep if necessary. Treatment should be repeated at 24 hourly intervals in dogs, cats and horses. If the animal only has one infected eye, it may be advisable to treat both eyes to prevent cross infection. In such cases, it is better to treat the uninfected eye first to avoid transferring infection via the tube nozzle. Animals must not be slaughtered for human consumption during treatment. Cattle, sheep and horses may only be slaughtered for human consumption after last treatment. Milk: cattle and sheep: zero hours. Meat: cattle, sheep & horses: zero days. Dispose of any unused product and empty containers in accordance with guidance from your local waste regulatory authority. Any contents remaining 28 days after first opening should be discarded. The consistency of Orbenin Ophthalmic Eye Ointment ensures even distribution of ointment across the cornea and the conjunctival mucosae. Effective cloxacillin levels are maintained for sufficient time, after only one application, to effect a cure in the majority of cases of New Forest Disease and Contagious Ophthalmia. Treatment of a batch of 'in-contact' cattle or sheep, at the time clinical signs first appear in some individuals, may reduce the overall severity of outbreaks of ocular disease on a herd/flock basis. There are currently no questions for Orbenin - be the first to ask one!